I was recently invited to style Ballet Imperial for The Australian Ballet’s blog, Behind Ballet. The Ballet is combining two one-act ballets, George Balanchine’s Ballet Imperial and Serge Lifar’s Suite en blanc, as the Imperial Suite. I wish I could be transported to Melbourne to see it in June! Principal Artist Lana Jones front and centre. Ballet Imperial is George Balanchine’s affectionate tribute to the spirit of Russian Ballet, as well as to the theatre which trained him and where he first performed. By extension, it’s an homage to Petipa and Tchaikovsky; the former Balanchine called “the father of classical ballet”; the latter studied at the Conservatory in St Petersburg, where Balanchine himself studied piano in addition to his training in dance. The work was first staged for the American Ballet Caravan in 1941, and was shortly after presented on a tour of South American republics, where it was performed in every one save Paraguay and Bolivia. It was felt that a ballet should be presented demonstrating the pure classic dance. Instead of reviving an actual classic, Balanchine composed his homage, framed in the Imperial blue and white of the Winter Palace. It was revived by New York City Ballet in 1964, and in 1973 Balanchine restaged the work with all-new costumes, changing the title to Piano Concerto No. 2 and dropping the Imperial references. In The Australian Ballet’s Ballet Imperial seasons, the work is staged in its original form. 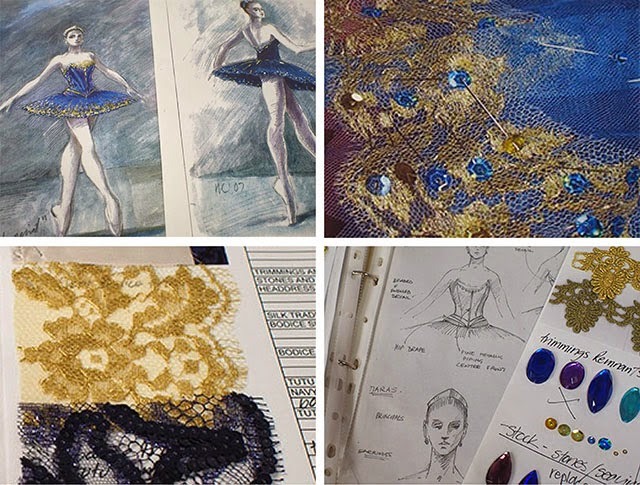 A central part of the performance are the beautiful tutus designed by Hugh Colman. That blue is such an astonishing shade that I made it the focus of my playful take (with no references to fighting in elevators, of course). Take a look here, and enjoy! Additionally: take a look at this beautiful short film by Gabrielle Menezes about a class of beginner ballet students. If you’ve ever felt intimated by the idea of an adult ballet class, it will definitely inspire you to try! Oh my god that blue, that gold, so perfect. Has this got something to do with why you were at the national ballet costume department today?! So pretty! And everything there is so magical isn't it? So beautiful! So delicate yet so fierce.